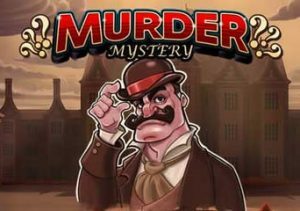 Awaken your inner Sherlock in Murder Mystery, a detective-themed video slot from Playtech. It’s a 5 reel, 40 payline game that comes with superb sound and visuals and a cracking range of extras. There are 5 bonus features that offer free spins with added wilds, multipliers or transforming symbols and a pick me round. Play amateur sleuth from between 40p and £1,000 per spin. The design in Murder Mystery has a Victorian feel – the entrance to a creepy looking country mansion forms the backdrop to the action here. On the reels you’ll see 4 lower value gemstones, 3 murder weapons (a dagger, poison and a pistol) and 3 potential suspects. The best of the standard symbols is the vampish woman in red who offers awards of up to 12.5 times your bet per payline. More rewarding still is the wild that spins in stacked formation and pays 18.75 times your bet if you find 5 on a line. On any spin, you could randomly activate the Murder Spins feature – 2 spins are awarded. On the first, the Weapon Spin, up to 12 question mark symbols drop onto the reels. They all transform into the same murder weapon and a payout is made. The process is repeated with the second Murderer Spin with the question mark symbols morphing into the same Suspect symbol. Another payout follows. There are also 4 bonus features which are triggered by landing 3 or more of the moustachioed detective scatter. Choose 1 of the following quartet of features. Wild Spins feature – 12, 16 or 25 free spins are awarded. 2 wilds are added on reels 1-3 on each of them. This is a low volatility option. Reveal Spins feature – choose this and you’ll receive 6, 8 or 12 free spins. Up to a dozen question mark symbols are dropped onto the reels on each of them. They can then transform into any value symbol, including the wild. The volatility here is in the medium range. Clue Hunt feature – this is a classic pick me round. You’ll be shown 24 clues. If you find a poison symbol, you’ll receive a 1x payout. Find a dagger and it’s 3x or a gun and it’s 6 times your total stake. You could also get a multiplier which boosts the payout by up to 10x. This is medium variance. Multi Spins feature – again 12, 16 or 25 free spins are on offer. All wins are boosted by a 3x multiplier and are trebled. Up to 12 question marks are added on each free spin too. This is the highest volatility option. There’s plenty to enjoy here. The sound and visuals are as good as you’ll find anywhere. If you like plenty of variety from your features, then Murder Mystery hits the target too. If your idea of a good night in is a classic detective drama in the Agatha Christie mould then Murder Mystery should deliver plenty of entertainment. If you like detective theme, you could try something more wacky with Ace Ventura Pet Detective – also by Playtech.